Once the world's most widely distributed mammal, the grey wolf has become extinct across much of its former range and its present distribution is much restricted. 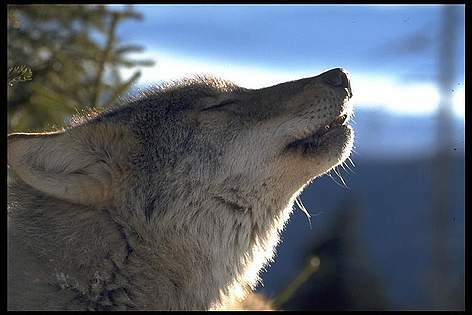 The wolf is an ancestor of the domestic dog but instead of barking, it howls. The grey wolf has a number of subspecies, including the Arctic wolf, which vary in colour and size according to where they live. The grey wolf has strong jaws with sharp canine and carnassial (cheek) teeth for tearing and chewing meat. Wolves may hunt alone, but usually they hunt in a family pack of between 3 and 30 wolves. The pack is led by an ‘alpha’ male and female, and the rest of the pack is usually made up of their grown-up pups. Hunting in packs helps wolves kill large animals such as moose or elk. They are good swimmers and when necessary pursue their prey into water. The timber wolf can eat a lot of meat at one meal and then go without food for a considerable time. Though it does eat large animals like caribou, musk oxen, deer and moose, most of its diet consists of of small animals like mice, rabbits and squirrels. It also eats fish, crabs and dead animals (carrion). Wolves generally pair for life. Mating takes place in late winter or early spring. A litter of 4-6 pups are born 2 months later. The family stays together for some time while the parents teach the pups hunting skills. In about a year, the cubs reach adulthood, but may stay with the pack for longer. The wolf's biggest enemy is man. For many centuries, wolves have been trapped, shot and poisoned because people fear that wolves present a danger to cattle and sheep. Sometimes they were killed for their fur. Wolves have been virtually exterminated from the continental United States and western Europe, although a few survive in Spain, northern Scandinavia and Italy. Wolves seldom attack humans, in fact very few records of them doing so exist. As long as there is plenty of natural prey, wolves prefer not to attack domestic livestock. Canis lupus Grey wolf Captive, photo was taken in March. WWF is exploring ways to strengthen wolf populations in Europe, for example by helping wolves spread into suitable remote areas from areas where they already exist. This includes research projects to evaluate wolf populations and measures to address the concerns of farmers and other local inhabitants who feel threatened by the presence of wolves. In addition, WWF works to protect the habitats and ecosystems on which the wolf depends. 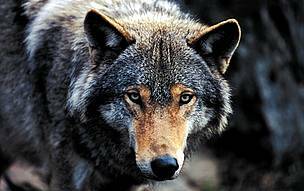 The wolf is the 2nd largest predator in Western Europe after the brown bear. The territory size of packs of wolves in Alaska and Canada ranges from 500 to 1500 sq km. A wolf's jaws are so strong it can bite through a moose femur (thigh) in just 6-8 bites.